Visit the Wordless Wednesday headquarters page to view other posts. My, it sure was calm enough to let you snap a shot. That little critter is fixing to bite his finger...where can I get one? Cute little critter, I like it. BTW, I love your header shot! I like your photo greatly. Thank you. Our pictures differ between only at first glimpse, because we both enjoy the same visual poetry... I bow to you - to the light under the surface of your unforgettable picture. Great shot, but I don't know for sure what that is. It's even smaller than a finger. The reptile said the words, but I won't tell what they are. Thank you everyone for your comments. 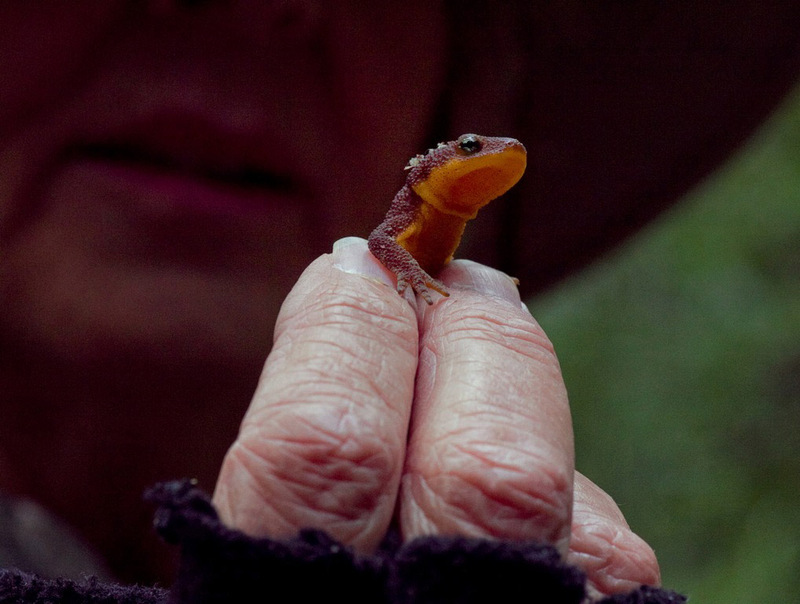 This little creature is called the California Newt because it's mostly found by the California coast. Our volunteer guide who was holding the newt in this picture probably wasn't aware that it will excrete toxins if it felt threatened. The guide was trying to keep it safe by moving it away from the main trail where bicyclists and hikers were abundant. such a cute fella but i'm not fond of reptiles of any kind. Oh! So! Cute! I love geckos and lizards and crawly amphibians. I don't recall ever holding one long enough to photograph it though - nice capture.